This trike has 2 operating modes of steering. Easily switch steering control between parent and child. Press the red button on the front wheel mudguard and twist the wheel 180° to transfer control from the parent to the child… and back again. Easy fold design that allows you to fold the trike while it stays intact— No dismantling needed! SmarTrike 7-in1 Folding Trike 500 is the ultimate compact folding trike for minimal space occupancy that can be set to either trolley or storage mode for an unmatched traveling experience. No hassle assembly no tools needed! Just click on the wheels and you’ll be ready to roll. 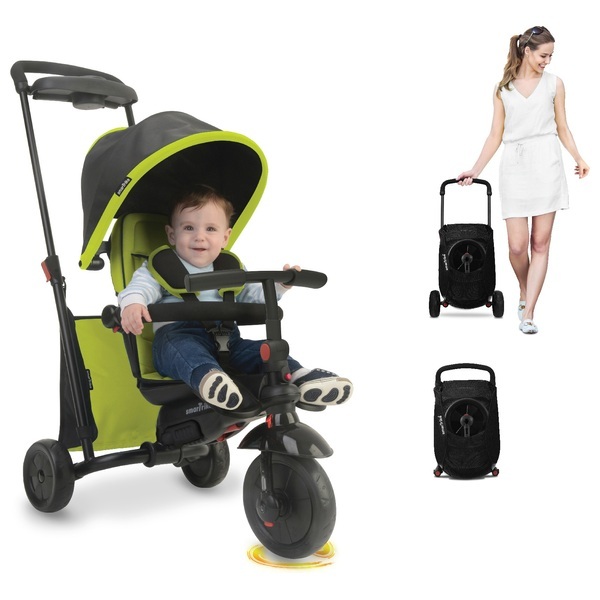 This unique trike features the patented Touch Steering system that allows stroller-quality manoeuvrability for an easy and smooth ride. This well designed trike will evolve with your child in 7 stages from 9 months to 3 years, helping them foster their sense of adventure and independence! EU Warning: Never leave your child unattended. Ensure all locking devices are engaged before use.